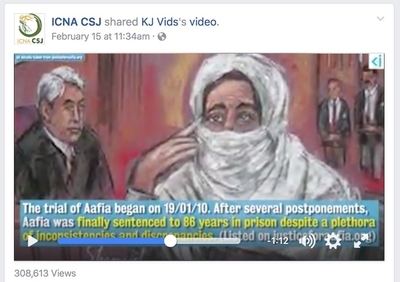 On Wednesday, February 15, 2017 the Islamic Circle of North America (ICNA) shared a video in support of Al Qaeda jihadist Aafia Siddiqui on one of its Facebook pages. Siddiqui has been described by FBI Director Robert Mueller as "an al-Qaeda operative and facilitator." She is currently serving an 86-year sentence on two counts of attempted murder. At the time of her arrest she had on her possession "handwritten notes and a computer drive containing recipes for bombs and weapons of mass destruction, instructions on how to make machines to shoot down U.S. drones, descriptions of New York City landmarks with references to a mass casualty attack, and two pounds of cyanide." While at trial Siddiqui blamed her persecution on a Jewish conspiracy and insisted that no Jews be allowed to serve on the jury. She would be convicted on February 3, 2010. In April, the 42nd annual ICNA-MAS Convention will be held in Baltimore. Congressman Keith Ellison is scheduled to speak, as is noted extremist Siraj Wahhaj. Keith Ellison claims to reject Islamist extremism. Will he still attend such a controversial gathering? And which side does he respect regarding Siddiqui: the U.S. courts with their evidence, or the Islamists with their conspiracy theories?